My bike came home! Thank you FedEx for doing a fine, fine job and getting it there and back in one piece. Thank you to Momo for helping me pack it up and for being there when FedEx came to get it. It’s all back together and I plan on going for a nice ride this weekend. The only bad news is that the aero bars DPR gave me don’t fit my fat handle bars. That’s right – I’m all in! I polled some women from my race club who have done this race and who have ridden with me and no one said, “are you kidding me. 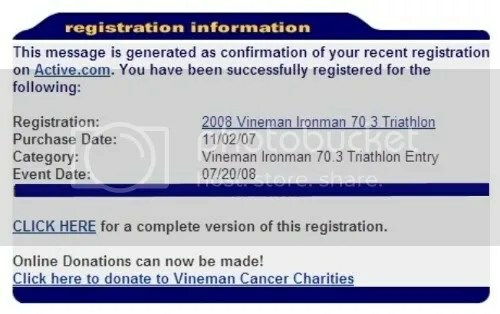 YOU can’t do THAT!” In fact they all said, “this is a GREAT event – do it!” So I signed up myself and IronMomJenny who is coming to do it with me. It will be my first half Ironman distance race. Anyone else out there doing it?? Speaking of Jenny – GO JENNY GO! She is racing IM FL tomorrow, naughty ticker and all so think good thoughts for her! 12 Responses to It’s a Good Day! Way to go!!!! 2008 is going to be a great year. Bully for you taking the big plunge, this does look like a very fun event. It’s gonna be a great year! I’m REALLY thinking about doing this…A lot of bloggers together, only ten minutes away from my Dad’s house…but it also involves a $1000+ airplane ticket for me, so I have to think about it another month. Hope it doesn’t sell out by then! Congrats girl..I know you’ll have tons of fun!! dang!!!! you did it! awesome! p.s. – cwap on the aerobars – maybe you can exchange them for some that do at your lbs? Cool! You’ll do great. I’m thinking of doing my first tri next year. Probably a sprint. You will love it-Beautiful race, venue. You will rock! that is only one month past cda. prolly not happening for me… maybe i can play sherpa??? oh, and i have an extra pair of aero bars – if you want to try them!